A great literacy center activity. 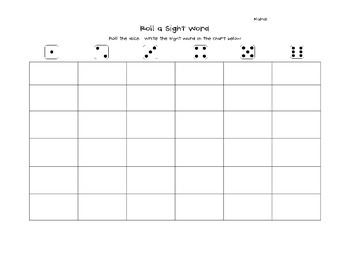 Simply assign a sight word that your class is working on in the box under each number. Make copies for each students. Give each student a dice and have them roll away filling in the corresponding word when they roll that number. You can have them race to fill up the whole board, race to see who fills up a column first, etc - the possibilities are endless! You can also use this to work on graphing skills, having students color in a square instead of writing the word. Change the words as needed. To make it reusable you can also laminate the sheet and use dry erase markers.